I think the happiest day of my life was the day Chipotle started serving brown rice. Maybe you think that makes me a total freak? But if that’s true, you clearly don’t understand my love for Mexican food. I mean, I live in Phoenix. Mexican food is more common than hamburgers. I’ve always been all about the cheese enchiladas. And quesedillas. Pretty much anything with cheese is sure to be a winner in my book. Did I ever tell you about how when I was younger I would “snack” on blocks of cheddar cheese? In fact, just this morning, I told Steve that cheese was my favorite food group. 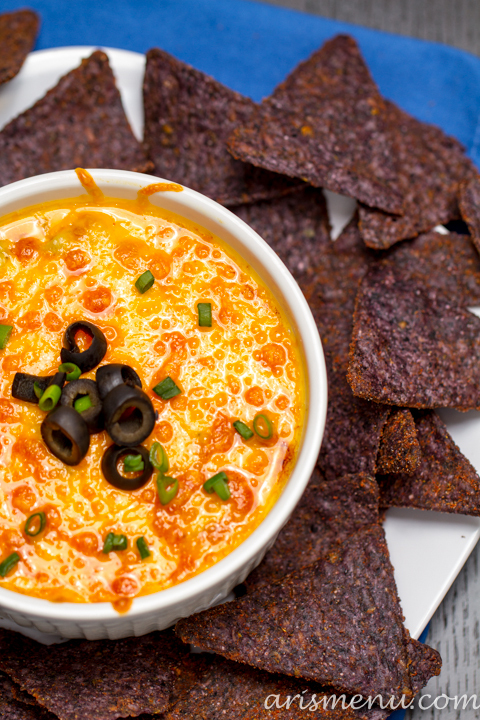 Luckily, this dip has the perfect amount of cheesy goodness, but with a lighter touch. Most of the creaminess comes from nonfat plain Greek yogurt and the avocado–the avocado is like my secret weapon. I put it in on a whim, and it ended up totally making the dish! It’s like if you took an enchilada and stuffed it with guacamole–I mean, HOW COULD THAT BE BAD??? 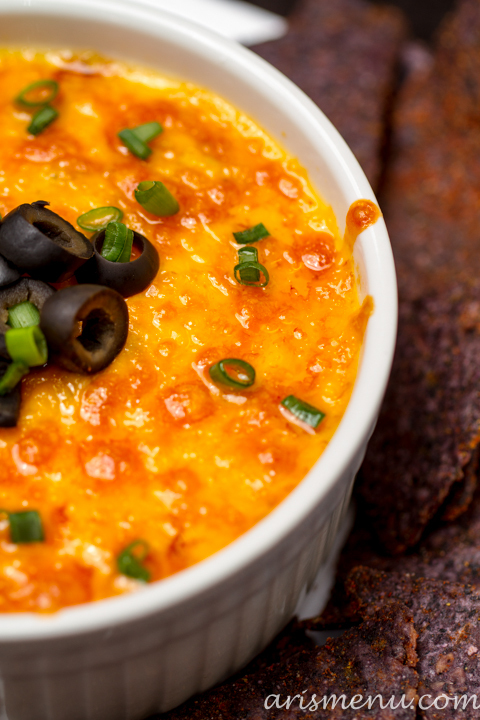 This dip is super simple with only a handful of ingredients, and it comes together in minutes. It’s perfect for any party or get together, and the bold flavors and creamy texture are sure to be a hit with whoever you’re serving! Do you guys do anything to celebrate Cinco De Mayo? My plan usually includes eating Mexican food, drinking margaritas, and apparently, wearing a mustache. You’ll have to check out the video to understand that one. Nicole and I were in a rare form of ridiculousness this episode. Make sure to check out Nicole’s perfect margarita recipe too! Green chile enchilada dip with creamy avocado, goat cheese and Greek yogurt. Perfectly creamy and cheesy, with a lighter twist. Combine chicken, goat cheese, yogurt, enchilada sauce and avocado in a medium pan over medium heat. Stir constantly until all ingredients are melted and combined. Transfer to your serving dish (make sure it's oven safe) and top with cheddar cheese (I used about 1/3 cup). Broil until cheese is browned and bubbly. Top with olives and onion if desired. Serve with chips or veggies. *I usually use a reduced fat cheddar cheese, but it doesn't melt quite the same. For photos, I used full fat. If you're concerned about appearance, I would encourage a full fat cheese, but if you're purely concerned with taste, reduced fat will still taste great! How cute are the two of you in the video! I love Mexican too and this looks all kinds of amazing. Cute video! And I dont even eat meat but I can say, this dip looks fabulous!! 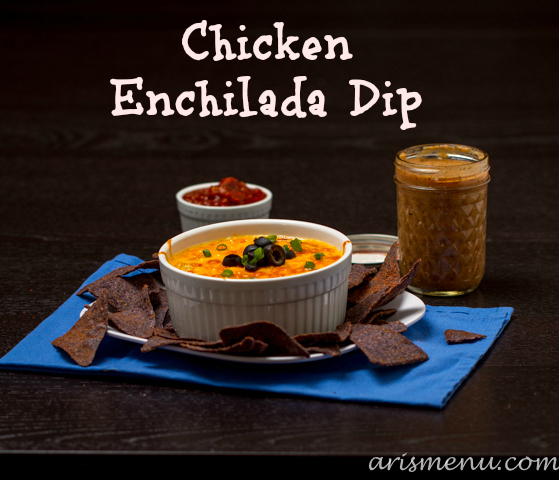 Chicken enchilada dip?!! Be still my heart! Im not normally a video fan–this was SO FLIPPING CUTE. I am so all over this. Y-U-M! I think we eat Mexican food in some version at least 3x/week. omg this looks amaaaaazing!!! 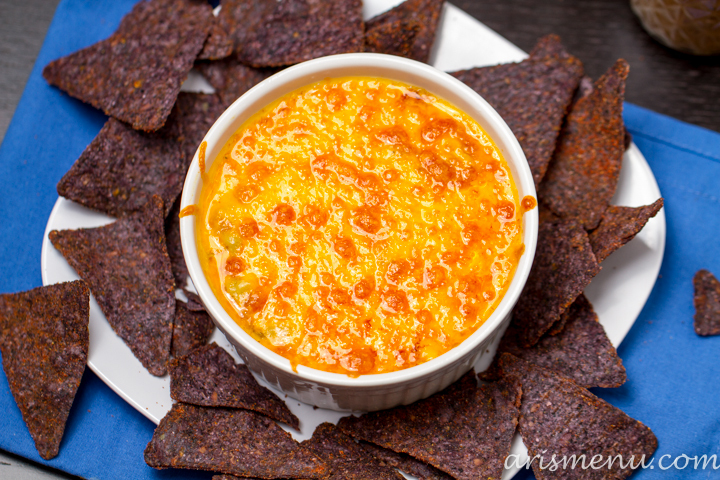 love all foods mexican and my hubs and i both are huge fans of dips! Yep. I would dip pretty much anything and everything into this dip. I LOVE enchiladas. I haven’t had them in forever though. I try to eat healthy when we go out for mexican and something tells me the overloaded enchiladas at our favorite stop aren’t very diet friendly! But I could easily make them healthier at home. 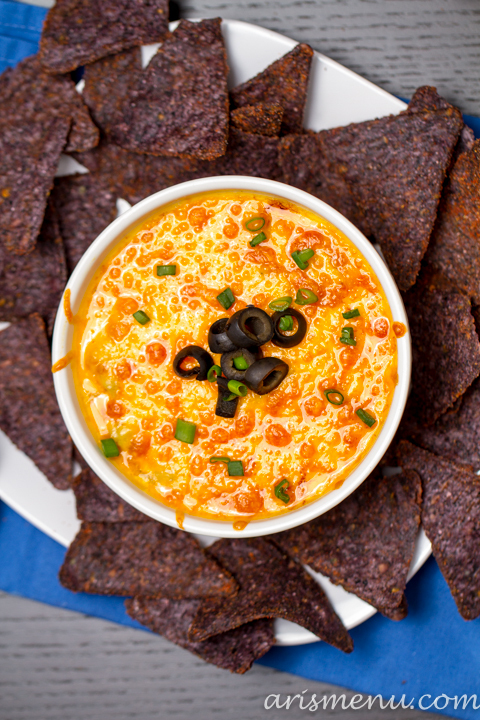 Or just eat this dip for the rest of my life. yummm-o. Would you be mad if I dunked my head into that goopey, orange deliciousness? AH HA HA. Clearly I was NOT taught table manners. OMG, yes! I want to dive in right now. MMM yummy!! I also enjoy the brown rice from Chipotle! So good. We usually don’t celebrate Cinco de Mayo but this year we are going over to our friends’ house for some festivities, not sure exactly what but it should be fun!